February 2018. I’ve had many ‘wow’ moments in the garden, but I think they started was when I dug up my first crop of potatoes; I was about eight and with my father on his allotment on a railway embankment in London. He grew all manner of food there from rhubarb to raspberries and peas to parsnips, with everything else in between. As long as he paid 50pence per year to the local Council he could keep on cultivating this piece of wasteland and help to feed his family. Now there’s a smart idea? 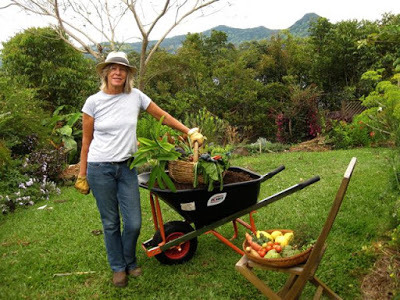 My name is Diane Hart and my journey has been an eventful one, taking me from the London to Sydney, Australia in the 1970’s as a young newly married migrant, and now to the North Coast of New South Wales – close to beautiful sub-tropical Byron Bay, where I have lived for the past twelve years. They say that one definition of an Aussie is that they change professions at least once in their life – this is certainly true of me, as I left behind my early training and work in medical research and took up the challenge of studying horticulture in Sydney once all my children had started school – this was my ‘eureka moment’ – I absolutely loved it from day one. 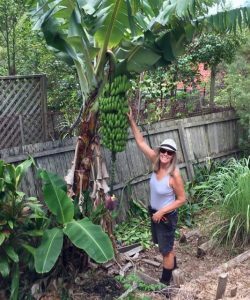 This lead to my own landscaping business – specialising in edible and coastal gardens, then, after more study, as an arborist, bush regenerator and environmental educator. It also gave heart and knowledge to my increasing awareness and love of the Australian Bush and my ongoing endeavours to try and preserve it for future generations. 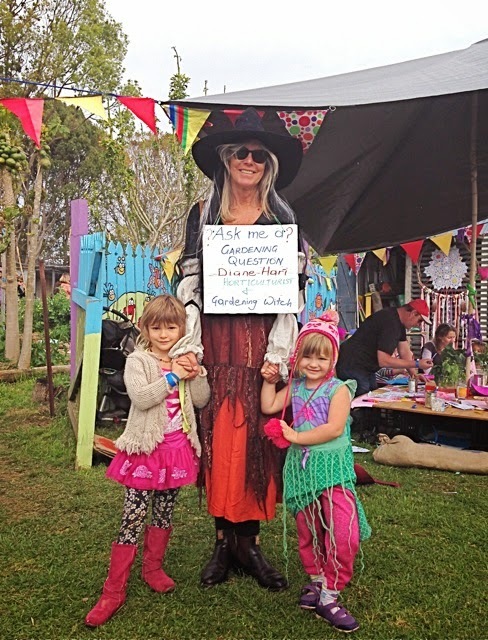 These days I’m retired but, like most retirees, busier than ever, running organic gardening and cooking workshops in my garden and teaching all kinds of classes – and enjoying my grandchildren. My passion for growing things, cooking healthy food and sharing it with family and friends just seems to grow – like my family. With three children and eight grandchildren there are always plenty of mouths to feed. One of the most responsible jobs I have ever had is to feed my family. 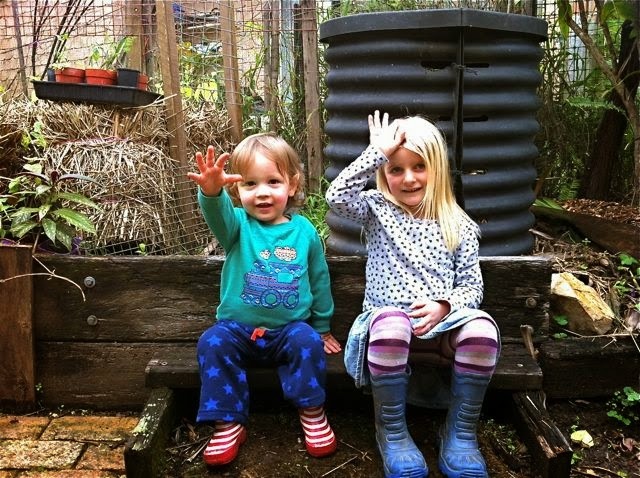 Growing your own food is a positively empowering experience that connects us to the earth and joins us with collective wisdoms that are thousands of years old – skills and knowledge that nurture you in a way fast food doesn’t. Oh, and did I say that you will find yourself out in the garden in your pyjamas at sun-up watching the butterflies flitting through the broad-beans, or thinking that a raindrop on a nasturtium leaf looks just like a pearl? It’s hard to deny that the past fifty years have seen rapid changes in the way we shop and eat. The industrialization of our food – with large supermarkets taking the place of the local shops – may have given us convenience, but the cost has been great to our health and the health of our planet. I often hear from people that it is much cheaper to shop at the supermarket and live off ‘convenience foods’ – apart from the negative health and nutritional impacts this is just not true. Food ethics is a can of worms (believe me, I know – to many in my ‘hood I am The Octopus Lady, but that’s another story) – so living and eating ‘consciously’ is my mantra – it’s a way of life that is both empowering and nurturing. 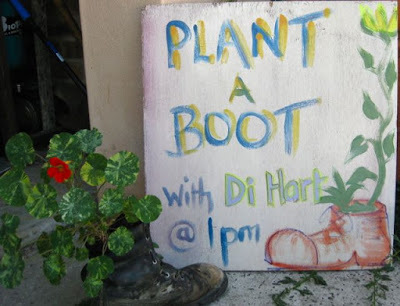 There are many lessons to be learned for us all about being more resourceful; reducing your waste, composting, growing a food garden, becoming energy self-sufficient, using the car less and the Farmers Market more. This also means getting back to eating what we have around us – making a small footprint on this beautiful planet and trying to be the person that I would like my grandchildren to be – well, at least giving it a go. One of the things I love about living on the North Coast is the constant sharing of home-grown produce – reminiscent of how I was brought up in the 1950’s. 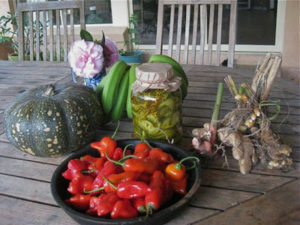 We had a pumpkin curry last night for dinner with poached tamarillos for desert – the beautiful orange pumpkin was from my son’s garden (fed by his horses), the chillies and tamarillos (along with bananas) from my friend Grant and eggplant from my neighbour. I had made some yoghurt (with milk from the local dairy) and had cucumbers and mint for the sambal together with last seasons mango chutney and, hey presto – dinner! 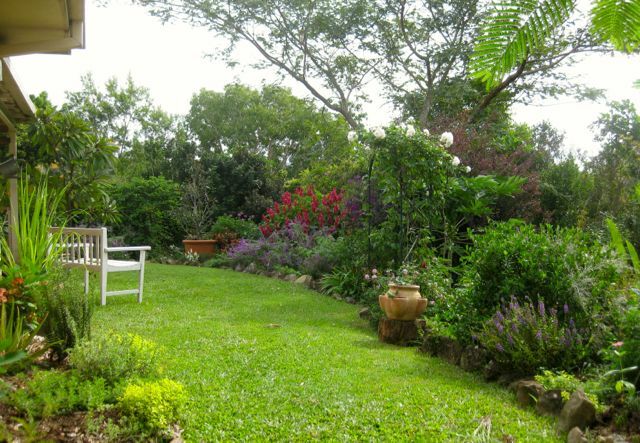 I live on a small suburban block on terrible clay soil but it is chock full of flowers, food, herbs, spices, tea plants – in fact, over 70 useful plants. You don’t need a lot of space to feed yourself – you just need to start.